Far beyond allowing women feel empowered through the avenue of fashion, Raven + Lily seeks to also help ladies around the world improve their lives by creating fledgling economies. Founded by Kirsten Dickerson and Sophia Lin, the company has already employed women in Cambodia, Ethiopia, and India. Now, they hope to bring their mission of self-sufficiency to the Maasai community of Esiteti in Kenya. Their project intends to work towards sending girls to school, showcasing the craftswomen's incredible beadwork, and to eradicate the practice of female genital mutilation (FGM). Each collection offered by Raven + Lily strives to be fair trade, eco- friendly, and a means through which women around the world can lift themselves out of the cycle of poverty, violence, and exploitation. Their latest line of jewelry highlights the skills of Maasai women. “When we started Raven + Lily, we felt that the most effective way to alleviate poverty was to provide women with sustainable income generating opportunities. Sophia Lin (co-founder) and I are fashion and design fanatics, so we combined our love of design with our passion to empower women. The designs must be modern and fashion forward while also reflecting the beauty and culture of the women. I think the more consumers are aware of the negative social impacts in the fashion world, the more they are looking for an alternative of something with a positive social impact without compromising great style. We are seeing the trend of sustainable fashion growing and it’s very exciting.” says Kirsten Dickerson. Their efforts are a part of a Kickstarter campaign that aims to reverse the practice of FGM. They hope that their partnership will help to pay respect to a vibrant culture as well as ensure the health and wellbeing of its women. 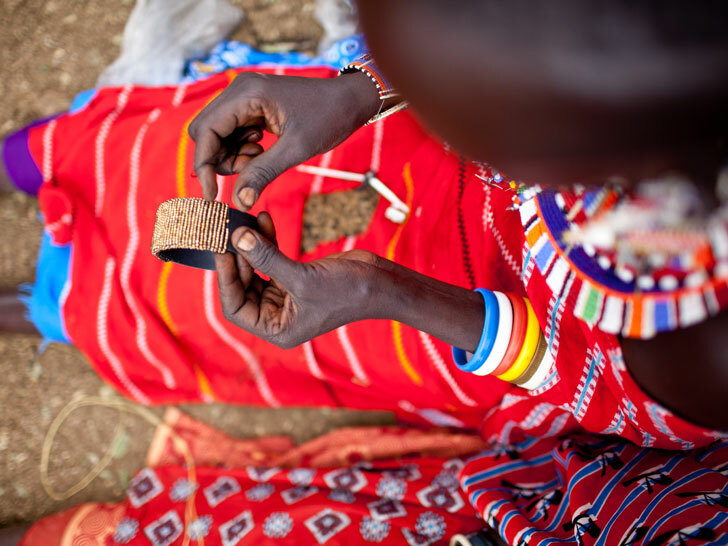 For a minimum pledge of $40, donors can receive a beautiful beaded gold bangle to accent their wardrobe while also immediately employing Maasai women. Each bracelet fuses contemporary style with traditional workmanship, standing as a symbol of strength and beauty both for the artisans and the women who wear them. Paying tribute to the talent and worth of the women who create the accessories, buyers around the world can proudly display their support for female solidarity and empowerment. why "modern design input"? i love their own input.. creative and very original.. lets start learning that beauty is subjective and how they see beauty is how i see beauty too, even though i was raised in a modern culture and never wore anything but "modern" from "modern brands" as i was growing up.. but now i developped taste for the hippie boho tribal style and i LOVE it. learn to value creativity where u see it, will u? give them the freedom to create! there ARE people who think THEIR input is more than beautiful and more than needed to bring back diversity to this world!